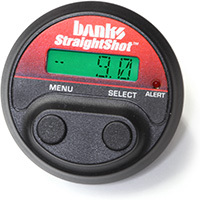 Banks Power brings you a new twist on a tried-and-true technology! You know that your engine performs at its best when the intake air is cool. Power is robbed by anything that heats the air before it gets to the cylinders. 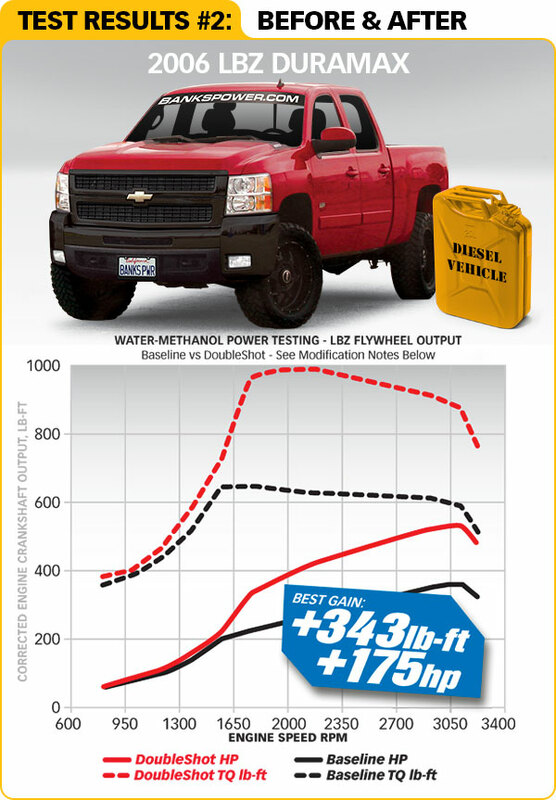 For years, hot-rodders, racers and even aircraft pilots have used water injection to cool the intake air, and occasionally add methanol for an extra boost of power. The Banks Straight-Shot and Double-Shot water-methanol injection systems bring a new level of optimization and control to this technology. Modification: 3” Downpipe/High Flow catalytic converter/all else stock unless otherwise noted. Dyno: Mustang MD-750 Load Controlled dual-roll. standard conditions using SAE J-1349, Averaged over three runs. Baseline Configuration: Stock other than noted (exhaust system modification). Steady timing retard due to 91 octane California gas noted during stock runs. Modified Configuration: As noted above, with Straight-Shot Low Volume system installed (Kit PN 45000), 7GPH nozzle, Cobb Accessport 100 Octane Tune (no timing retard with StraightShot injection). All tests run on CA pump 91 octane gasoline. 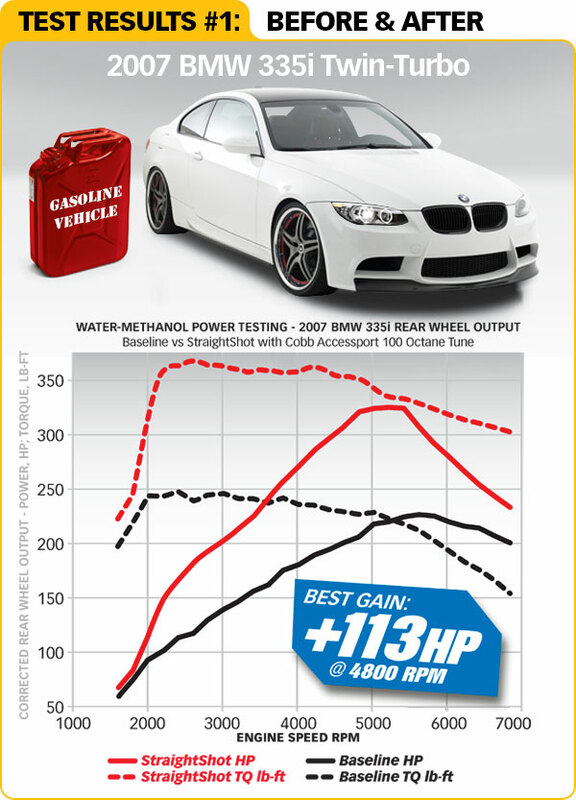 Data: Engine Flywheel HP/TQ, corrected to standard conditions using SAE J-1349, Averaged over 5 seconds per step. Baseline Configuration: 2006 LBZ-Equivalent Duramax Longblock with dyno intake/exhaust, stock turbocharger, OE calibration (360 HP). All tests run on CA Pump Diesel #2. The Banks control interface for both injection systems is simple yet sophisticated. Completely housed in a compact, easily-mounted 2-1/16” gauge head unit, it allows the user to fully command 2 stages of injection for maximum tunability. It also doubles as a multi-function gauge, displaying boost or TPS %, EGT* and pump duty cycle on the digital display, as well as indicating system activity and any errors with the on-board LED (*optional, available when equipped). Universal models contain a high-precision on-board 100 PSIA pressure sensor for boost sensing, while plug-and-play models connect to your factory MAP sensor. The system can be configured to inject based on boost pressure, throttle position signal, exhaust gas temperature (EGT), or a combination of either boost or throttle plus EGT. Fully adjustable progressive multiple-stage control allows for fine-tuning when towing or racing; whether you're after mileage improvements, EGT reductions or big power gains. This versatility allows for use on gas, diesel, boosted or normally aspirated applications; It can even be used for external cooling on intercoolers or brake systems! 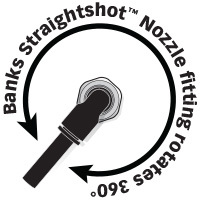 The injection nozzles are brass, specifically designed for this application to achieve optimal atomization of water or water-methanol over a wide pressure range. A large 5/8” wrenching hex makes installation a breeze, and a stainless steel screen is integral to keep debris out of the orifice. A range of sizes is provided with each system, with 10 flow rates available to custom-tailor system performance. Two different pump output volume ratings are available to properly match your engine's needs and offer proper adjustability. Both pumps feature a built-in output pressure switch for low fluid or leak detection, an adjustable re-circulating pressure regulator, integral push-lock fittings and a rubber-isolated mounting bracket for a clean, quiet installation. The best plumbing available is provided with the highest cross-sectional flow area of any system on the market. Nylon tubing and EPDM seals are methanol compatible and can withstand 300 PSI at underhood temperatures. Installed fittings have 360° swivel capability for full flexibility. Dual-stage systems include both a low-restriction check valve for the primary stage, as well as a huge, all-stainless 3/16” orifice control solenoid for the second stage - properly sized components minimize pressure drop prior to the nozzle, maximizing output and atomization. The controller will support a second solenoid in place of the check valve for maximum system performance. No cutting, splicing, and crimping here! The wiring harness is fully connectorized with automotive grade sealed connectors. Designed to plug and play with most factory boosted applications with enough length for virtually any installation configuration. Plug-in extensions and adapters are also available to aid in custom applications. The system is smart enough to detect when wiring, connection or component faults have occurred and will alert you to the problem. The System Safety output allows further action to be taken when the controller detects a fault or low fluid condition. 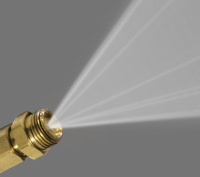 A plug and play EGT sensor is included in the Double-Shot system (and may be added to the Straight-Shot system as an option) to serve as a trigger or auxiliary sensor. When in use, the display can also show EGT. 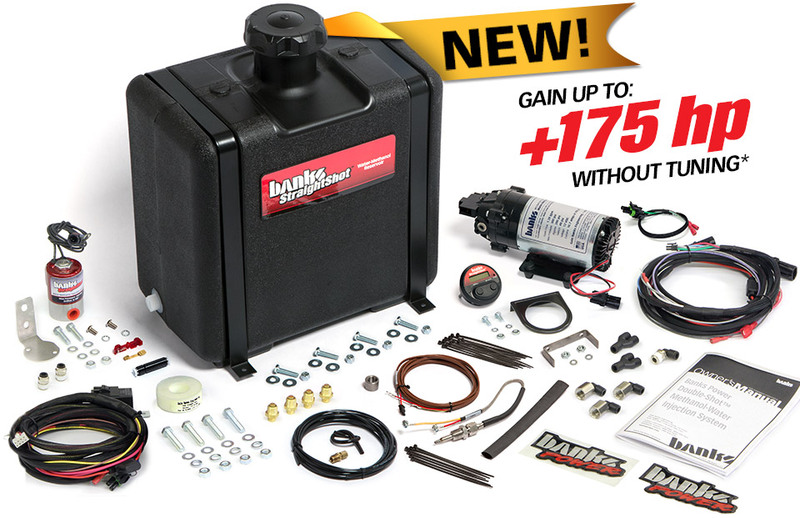 Great option for diesel owners! 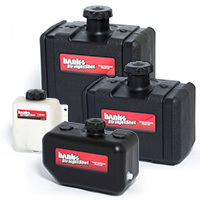 Select from 3/4, 2-1/2, 5 or 7 gallon tanks that can be mounted anywhere on your vehicle depending on your specific needs. Or simply plumb the system to run from your existing washer fluid reservoir with the included fitting. *Contents, features & performance results vary by application. Most products are CARB E.O. certified or in processs. Power measured at the rear-wheels, airflow improvements recommended.